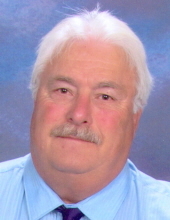 Winnebago – Ronald “Ron” Eugene Lancaster, 70, of Winnebago, passed away Tuesday, April 9, 2019 at Rockford Memorial Hospital. He was born July 9, 1948 in Sterling, IL, the son of Keith Neal and Donna Sue (Overly) Lancaster. He graduated from Leaf River High School in 1967. He was a veteran of the United States Navy serving as a medic and dental technician from October 3, 1967 to September 1, 1971. Ron married Suzanne “Sue” Roberta Reynolds on September 8, 1973 at Middle Creek Presbyterian Church near Winnebago. Ron was self-employed as a dairy farmer and he served local farmers with his air conditioning business. He also enjoyed helping farmers during the farming seasons. He truly enjoyed driving and working on classic cars, especially his 1967 Chevelle SS. He could fix just about anything and loved helping others. He was a true “Gear Head”. Ron is survived by his wife, Sue Lancaster of Winnebago; daughters, Jen (Dale) Ralston of Rockford, Angela (Damian) Acosta of Rockford, son, Brian Lancaster of Byron; grandsons, Austin Lancaster and Adrian Acosta; brothers, Steve (Marcia) Lancaster, Kevin (Maureen) Lancaster; brother-in-law, Chuck (JoAnn) Reynolds of Oregon, sister-in-law, Jan Fletcher of Winnebago; mother-in-law, Wanda Reynolds of Winnebago; several nephews, nieces and his special dog, Asia. Ron is predeceased by his parents. A Celebration of Life Memorial Visitation will be 1:00 p.m. to 3:00 p.m., with Navy funeral honors at 3:00 p.m. and a time of sharing to follow, on Sunday, April 28, 2019, at the River Valley Complex, 605 Main St., Leaf River. In lieu of flowers a memorial will be established. Cremation rites accorded. Genandt Funeral Home, 602 N. Elida St., Winnebago is assisting the family. For an online obituary and tributes go to www.genandtfuneralhome.com. With Navy funeral honors at 3:00 p.m. and a time of sharing to follow. "Email Address" would like to share the life celebration of Ronald "Ron" Eugene Lancaster. Click on the "link" to go to share a favorite memory or leave a condolence message for the family.